A week of application, 3 days of intensive training and a day for evaluation. 15 people managed to reached the final spot! Some people might know the people who will use any of the name listed on the image above. So congratulations to those who passed the training period and i hope there will be no hard feelings for those who didn’t make into the final cut. Attention players from Poland! i am still accepting CS application from your country so for those who have the guts to what it takes to be. kindly submit your application to wyd_cm@gamenetworks.com and make sure that you follow my instruction carefully. Have you ever experience being nervous at a time of your life. Do you remember your very first job interview or school interview with your headmaster? Those times that your body shivers, hands trembling and blurry visions. I bet you did because I know they did! After a week of intensive filtering of the applicants we decided to meet those who applied in-game. Most of the applicant we meet feels nervous at first which is quite inevitable especially if you are applying for a job. A common conversation during the interview…. So when an applicant faces the interviewers namely (tabbed) “Simon Cowell, Paula Abdul, Randy Jackson, Kara DioGuardi and even Ryan Seacrest ( Me of course , CM Mickey, GM Stark, CM Taiga with special appearance of GM Helius, Scary and Evil Ghost ) they can’t help themselves but to sing at the same time. “How can you describe WYD to a blind person since birth”? Decapitated head cause Blindness.. seriously. Now that the interview phase has already ended. All i can say is that you guys did well and good luck to your application. So the next step will be the “Examination” so do your best! Give your self a pat in the head for being a part of creating a milestone by reaching 100,000+ Unique visitors in the CM;s blog! And of course i express my gratitude for all those who remember and greet me thru the forums… +1 to my age! The celebration can be found here. Another reason to celebrate in the Game Networks Forum. I can never explain the happiness that I felt when I see the Game Networks forum alive. As you know it used to be a “dump site” and people are not even aware of its existence. But look at it now! It is like a phoenix rising from its ashes. Wydian’s are continuously joining and participating in online discussion and sometimes e-drama which are quite essential for the forum community. 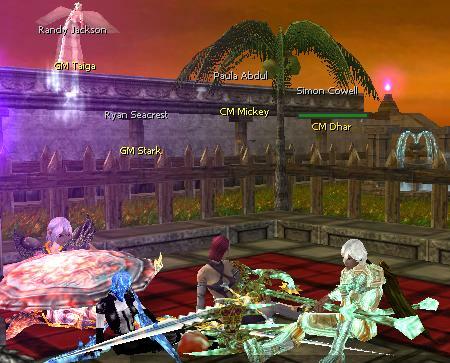 So let me express my gratitude to the players/forum users who keeps on inviting their friends to make our forum alive. Meet CM Mickey my lovely assistant in handling our beloved community. If I am not around in-game they she will be there. Just be nice to her ok and don’t give her a headache! She’s still on the process of learning how to become one! So who wants to be my assistant (beside CM Mickey of course)? First of all guys and dolls the job of a Community Scout is not a games we are doing some serious business here. Imagine you will act as some sort of a Community Manager of the person who speaks your common language or residing in your respective continent? With great power comes great responsibility… and also great rewards that can be doubled! You heard it right doubled depends on the circumstances. I just noticed that some applicants didn’t even bother to read the instruction on the event page and that will result on either a bad impression from me of course or totally rejecting their applications. Most of you guys received my email reply right? And I’m serious about it. Consider interacting in our forums a part of the screening process. So for now good luck future scouts I wish you all the best. Getting bored with the current game play? Well here is something to look forward to. Somewhat big is coming to town? Talk about the Spanish word “Quatro”? Ring a bell guys and dolls or you still don’t have a clue? We already received the patches from the developers and the team is currently busy on the localization and testing of the Episode 4 Patch aka 7.53. There is no tentative date for its release but if ever we finished the localization process earlier as expected then it will be good! So better watch out and better not cry because episode 4 is coming to town! Hopefully by Christmas (or earlier!). WYD Global Launches Community Scout System. To have a united community, the WYD Global community managers decided to search and decided to hire players to become a scout that will act as a representative or a middle man especially for the players from non-English speaking countries. They will become the assistants of the community managers and they will handle some task such as community coordinators, feedback gathering and forum moderation. The recruitment period will start on Nov.4 and will end on Nov 18, 2008. All interested applicants are welcome as long as they possess all the qualifications needed. Visit http://wyd.gamenetworks.com/ for more information. Reflecting about the Hallow-WYD again!…. So this is the content of our box this Halloween! Hello Guys and Dolls looks who’s back on track. First of all I would like to apologize for the lack of blog updates in the past few weeks for the reason that I’ve been busy on informing online communities about the latest updates and development of you know what. Talking about “Guys and Dolls”. Many of the WYDian’s are wondering why i greeted them with “Hello Guys and Dolls” and not just the Usual Hello or Hi? Well its kind of boring if i just say the usual so i have to think of a different way. Anyway just to clarify something for those poor souls who who misunderstood the text that i encode. I do refer girls as dolls in my greeting context but it doesn’t mean that i treat them like one. My greeting came from a musical as well as a movie. Talking about other Community Manager’s. Since the Halloween is a few sleeps to go our team decided to release a new costume to be added to your dress up collection. For screen shot and PR purposes I asked my team for those costumes so if ever you want to have the form of the macho cat man or do you miss my first form the “big bad cat” ( Also the form of GM Fury and Hyperion) . Then this costume is a must-have! When Freya finally wears the costume the playful me strikes back and attacked her to show a literal “CAT FIGHT”. And here’s what I got! Freya’s creative juices is overflowing making her role play a role of a Cat Wife beating his Cat Husband for coming home late! Don’t “Meow Meow” to me! We really portrayed a literal cat fight aren’t we? I am really a fun of guild wars myself and i never fail to watch exciting fights between guilds and what amuses me today is the fight between AUTHORITY and EXTERMINO..
Let this random quotes from players explain to you why i got amused. Talking about putting spice to a sleeping competitiveness of guilds? That’s all for now and make sure that you check my post below about the upcoming “Whats hot and Whats Not?” this season. This ultra cool event will unfortunately end in tuesday but! If you want this event to get extended the Vote for it now! The outcome will depend your vote so call your friends and vote! Come in for a spell. WYDians. Halloween is coming soon. The popular MMORPG WYD Global also get ready for the month-long event introducing new events, items and monsters. That will chill the spine of your gaming experience. Wydians Grab your brooms since we will be having a FANG-tastic Halloween gaming experience this upcoming Tuesday after maintenance! WYD Global players can expect season themed events and as well as in-game updates. • Monsters in the Underworld Map of the Khersup Continent can now possibly drop Water Scroll (Normal). • Mirror… Mirror… on the wall who’s the strongest of them all? Do you have the guts to face up your inner shadows? This competition will allow you to fight to an exact clone of your character so it’s time to know “more” about yourself! • People often said “What’s inside your Box?” During this Halloween season monsters around the Khershup continent will drop a treasure box. The content of the box might be a trick or a treat! But a little warning WYDIAN’s there’s a living creature inside that box! Have a Happy halloWYD guys and Dolls!